Remembered: members of the Polish airforce who died in WWII. There was a special ceremony in Ruislip on Saturday. Collapsed: an Eastern European beggar, who died whilst in custody at Forest Hill police Station. Exposed: how West London gangs use Facebook to arrange fights. Aflame: a bendy bus which caught fire at Victoria station yesterday morning. No. 73, since you ask. Jailed: the creepy blogger who stalked a children's author. Rewarded: a Fulham cafe run by ex-servicemen. Dognapped: this handyman's Jack Russell. 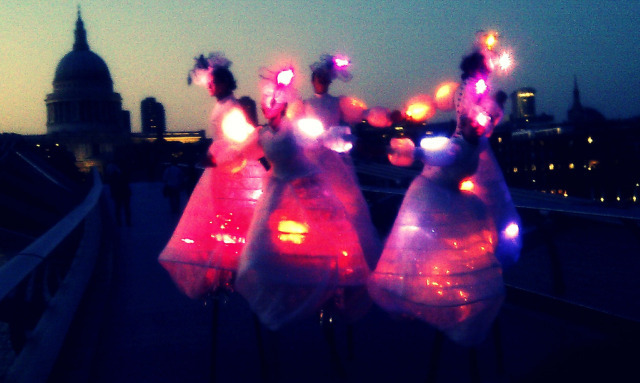 Bankside Fairies, by Alex @ Faraway via the Londonist pool.